Packing like a rock star: yes you can do it. What is a well organised travel bag? It’s a bag quick to pack, where you can easily find your stuff and that you can repack in a breeze. You want to pack in such a way your stuff travels safely snuggled in your bag and is wrinkle free when you reach your destination. You also want your luggage to be well organised so you don’t need to rummage through it to find what you need. Last but not least your want the re-packing to be hassle free. It is bad enough holidays are over, you don’t need to add any packing stress to it. Here is how to get there in three easy steps. When you pack you have your clothes and the rest. All the rest can be categorised into several families: socks, underwear, shoes, toiletries, tech accessories, toys, entertainment things, sports clothes, etc. 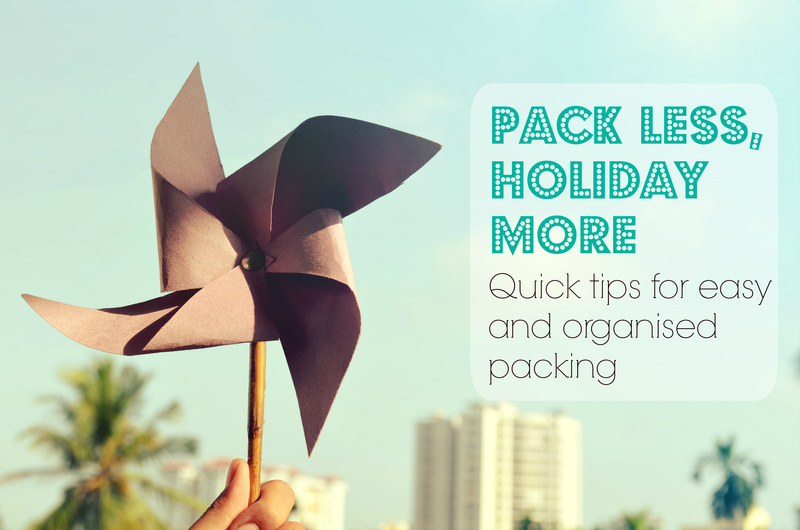 The trick is to have them organised into separate bags where they can live for the length of your holidays. This is useful for packing but also for when you get there: you just need to take the bags from the suitcase to the drawer. That’s it, you’re ready to enjoy your well deserved holidays. No need for hours of unpacking. Consider what you’re packing when choosing the type of bags you’ll use. Too many plastic bags will make for a noisy trip when you’re going through your stuff. But products that may leak like shampoo or solar scream must be kept in resealable plastic bags. You also need to pack a few empty bags. They will come handy for your dirty laundry or to pack all the new things you’ll get during your stay. Pick a selection of sizes and materials: large and small bags, some fabric pouches and a few clear zip plastic bags. To save you more time you can even leave those in your travel bag at all time so you don’t need to hunt them down each time you’re packing. Compartmentalising is really a life saver if several people are going to pack their things into the same suitcase. To make things easier, think about code colouring the bags or having a way or another to identify which is whom. If travelling with young children or a baby, put together a bundle of essentials for each day (for example: pair of socks, pants, bib, etc.) and pack them individually. Let’s talk about your clothes now. You need to store them in such a way they take as little space as possible and they stay as wrinkle free as possible. In that matter there are three ways of doing things: folding, rolling and bundling. My personal belief is that you need a bit of all. Rolling allows you to create an even layer at the bottom of your suitcase and helps keeping the garments wrinkle free. Even better: roll them up in a sheet of tissue paper to keep them neat. Most tops can be rolled up. Skirts, everyday dresses and most trousers can too. Bulkier items like jumpers and jeans later don’t do rolling so well. They need to be folded together in such a way they form an even bundle to be added at the top of your roll layer. This is when you put your puzzle skills to good use. Keep the more wrinkle-prone items on the outside of the bundle. Delicate or formal items like evening dresses or suits are to be folded. Turn suit pieces inside out. Store evening gowns in their own plastic pocket or bag. Believe it or not, order matters when packing wisely. First up are the shoes. Put them on the wheels side of the case or at the bottom of a soft bag. Fill them with some of the smaller items that you may not need urgently, like socks or toiletries. Next are the clothes and here you’ll work in layers. The first layer is made of your rolled up clothes. You’re building an even foundation on which you can add your bundles of clothes. Folded garments come on the top of your bundle. As you go and between each layer of clothes, use your bags of smaller items to fill in the gaps so each layer is even and ready for the next one. Keep your essentials on the top of the travel bag. Pyjamas and toiletries need to be easily accessible when you get to this hotel room in the middle of the night with a bunch of exhausted children hanging onto you. Anyway your suitcase is so well organised that you can leave the unpacking until the morning, it will take you only a few minutes. Who do you thank now? Now you have it. I’m not making this up: these tips work. Please tell me what you think or if you can do better. I’m always looking at growing my packing goddess skills. If you’re looking for cotton bags for your underwear, check out my lingerie bags. They come in various styles and colour. I also offer personalisation options.